Mumbai Port Trust invites application for the post of 259 Graduate, Technician & Trade Apprentices. Apply before 20 January 2017. For Graduate Apprentice - Degree in Mechanical / Electrical Engineering/ Technology from a recognized University. For Technician Apprentice - Diploma in Mechanical / Electrical Engineering/Technology from Board of Technical Education of a State. For Trade Apprentice - Passed 10thstd (SSC) or equivalent and passed National Trade Certificate Examination in the trade of Computer Operator and Programming Assistant(COPA) in I.T.I. Application Fee - Candidates have to pay Rs. 20/- through Indian Postal Order payable at GPO Mumbai /Demand Draft/ Banker’s Cheque/ Pay Order in favour of the Board of Trustees of the Port of Mumbai. 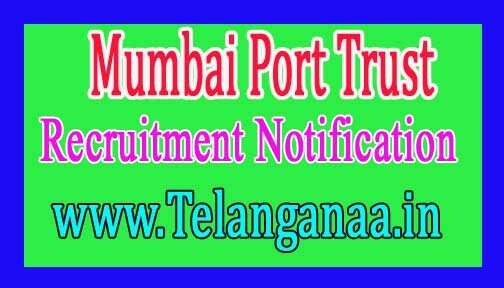 How to Apply Mumbai Port Trust Vacancy - Interested candidates may apply in prescribed application form along with relevant documents send to the Training Manager, Apprentice Training Centre, Mb.P.T. Workshop, Narsu Vithoba Nakhwa Marg, Mazgaon, Mumbai-400 010 on or before 20.01.2017.